We stayed up talking until 7am the next day. Ha brought out fishing gear, photos, books and things. She showed me her old wedding band--it was just like mine. She asked if I wanted it and said if I gave her mine, she'd give me hers. It was a deal. When Brent left the room I told her if I'd known she had a roommate, I never would've called her. She said,"I know, that's why I didn't tell you". We discussed cycling, her running days, and she often said how great Alexandria, Virginia was, and how great it was for cycling. She didn't like Fayetteville where she was living, and missed Alexandria. She'd lived there her first 13 years in the United States (her family were Vietnamese refugees) and her two brothers, whom she hadn't seen since her mother threw her out five years ago, still lived there. Ha's father was imprisoned after the fall of Saigon in 1975, and later executed as a political prisoner. She never met him. 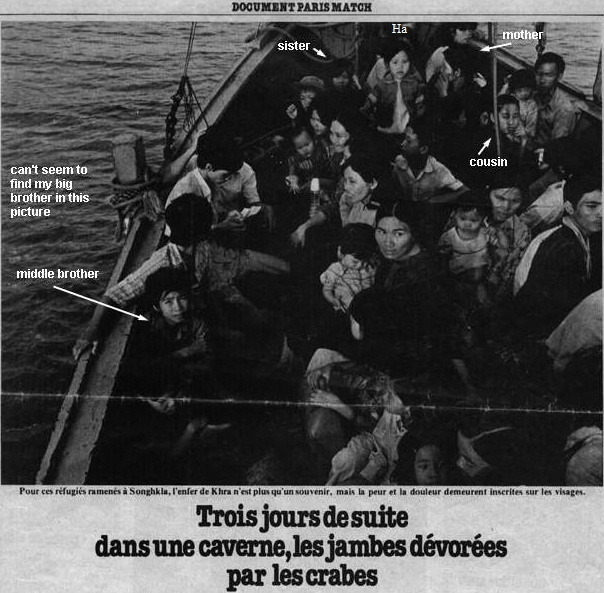 This French newspaper clipping shows her as the child, standing between her mother and sister, at the time of their rescue in 1980. I slept on the couch while she and Brent didn't wake up until 5pm that day. She brought me blankets in the night and worried about my comfort. The three of us went to a movie that night and a Vietnamese restaurant. She never explained her relationship with her roommate, Brent. Her house was shaggy, and I thought, "If only she could see my nice house in Virginia". I also wanted time away from Brent so we could really talk, and if she wanted to say anything to me she could. We'd seemed so close on the computer (before she disappeared). I asked her if she wanted to see my house. She was interested, and said she'd love to get out of Fayetteville for some fresh air, but I soon realized that the problem was Brent. He was feeling left out with our long talks, her paying too much attention to me, and virtually none to him. She'd whisper things to me when he was in another room, that he was upset with me. I didn't care--I felt I was where I belonged in the world, with her. One time he left the house when we were talking, and we didn't notice he was gone. He didn't trust me and was suspicious when I phoned Miimii and asked her to leave the house so we could visit. Eventually Ha told him she wanted to go and if he didn't like it he could leave. With Brent sitting behind her, working on the computer she said,"We're just friends, right? If we are more than friends then I can't go with you" I paused and said,"of course". I felt I was in love, and with that came respect for her.